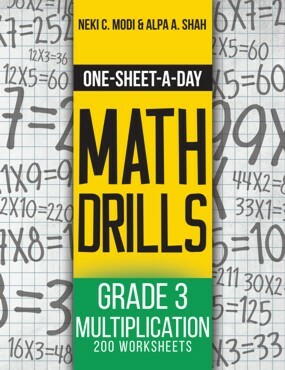 This One-Sheet-A-Day math drill workbook is for 3rd grade students who want extra practice with two numbers, one or two digits multiplication. It contains 200 math practice sheets, one for each school day of the year. Upon completion, the student will be more competent in 3rd grade mathematics and ready to proceed with more difficult exercises. Unlike other math drill books, this is one of 24 workbooks created to establish a daily routine for each student to practice on their own from grades 1 through 7. It is specifically designed to gradually increase mathematic ability with the least amount of stress for both parent and student. Kids need to practice at home to support what they are learning in school, but finding resources to help with that goal can be daunting. It takes a lot of time searching online for free resources to print or for books with enough exercises. Beyond that, the options include going to libraries, enrolling them in an afterschool class or hiring a personal tutor. Who has the time and money for all of that? The answer is, not many parents. Each and every parent wants to provide enough practice work to their kids, but on top of the challenges in finding resources, questions remain about how much practice a child needs to boost educational success: twenty sheets of practice work a day? One sheet a week? What's the optimum practice work during a whole academic year? Confused? The authors have a decade of classroom expertise and have spent a large amount of time researching and wasting resources trying all the options for their own kids. Now you can benefit from what they have learnt. The result is finding out that "ONE-SHEET-A-DAY" is the optimum way to support classroom learning, and it is amazingly simple. This book eliminates the need to take home prints or run around franchises, bookstores and libraries trying to find enough material. It also prevents you from overwhelming your kids with too many math drill worksheets. There are approximately 200 school days a year. Simply have your child complete ONE per day. Work is far easier when it is part of a routine, especially for kids. The One-Sheet-per-Day program is an easy routine to start and maintain because it takes less than 20 minutes per day, using basic skills your child already knows. Simply take one sheet from the book, ask your child to complete it in a quiet place, and return it to you to check the answers, a painless routine for you and your child, and instant feedback for both of you. Geared to follow most math curriculums, most kids can do the appropriate sheet on their own based on what they are learning at school. "One-Sheet-A-Day" math practice drills will give your child practice they need to score higher on test day, and build confidence in their math abilities. With almost a decade of teaching experience, Neki and Chintan created this book series to fill the gap in available study aids for their own children. After testing a variety of resources with little success, they decided to combine their professional expertise and come up with a better solution for parents who don't always have time (or patience) to give their child all the personal attention they need. Putting their heads together, they realized that kids go to school for about 200 days a year. From this simple observation was born a brilliant solution: give each child "One-Sheet-A-Day" to practice mathematics drills. With this amazingly simple idea, Neki and Alpa prepared this math drill book as a practice tool to share with other parents trying to help their children at home. Now, parents everywhere, can use it to save loads of time and money, and their kids can begin practicing right away.